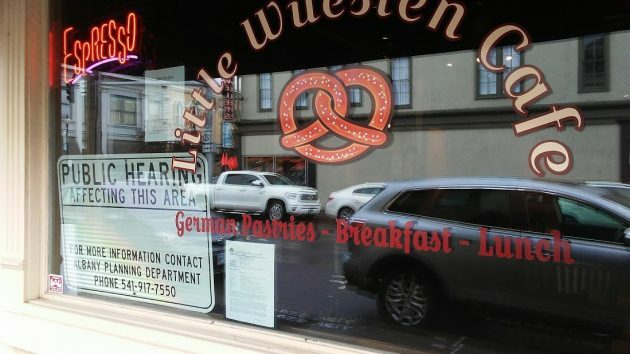 The big sign in the window advertises a public hearing regarding the Little Wuesten Café on Ellsworth Street. Here’s an update on the story below: After a public hearing of about 10 minutes, during which only the applicant spoke, the Albany Landmarks Advisory Commission tonight (Oct. 4) unanimously approved an “alteration” on the outside of the Bikman Building so that the Little Wuesten Café can install an exhaust fan in a second-floor window facing the alley on the building’s south side. Having breakfast in one of the newer restaurants downtown, I could not help but notice a sign announcing that a pubic hearing would be held. The hearing concerns the fan of a hood over the stove, and I figured there must be a story there somewhere. Yes, there is. The restaurant is the Little Wuesten Café at 115 Ellsworth St. S.W., in the Bikman Building. It’s named after Wüsten, the hometown in northwestern Germany of the owner’s husband. The owner, Liz Bobe, told my wife and me some weeks ago that the fire department had inspected her restaurant and told her she would have to install a new hood in the kitchen. The hood requires an exhaust fan to the outside. The Bikman Building, designed by Charles Burggraf and built around 1925, is considered historic, and any outside alteration such as this fan requires approval of the city government, namely the Landmarks Advisory Commission. 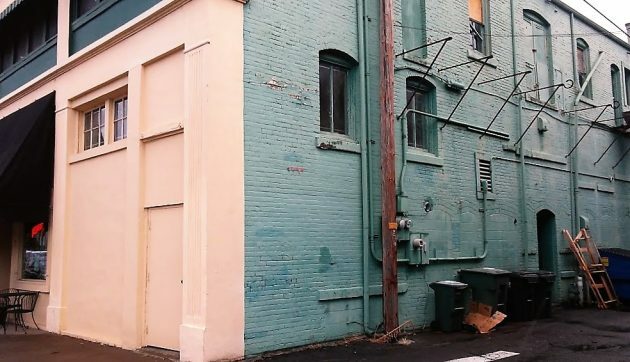 Landmarks will hold a hearing on Mrs. Bobe’s application to be allowed to install a fan in what is now a window facing the alley on the south side of the building. The hearing will be at 6 p.m. this Wednesday (Oct. 4) at City Hall. The city’s community development department, noting that the hood and fan are necessary as a matter of fire and life safety and won’t materially affect the building’s appearance, has recommended that the application be approved. The application includes a price quote for a “Type I hood” with a “belt drive centrifugal sidewall exchaust fan.” The quoted price was $11,250. The breakfast I was eating — scrambled eggs with a mountain of fried potatoes and a bowl of spinach — was outstanding. It cost $6. At that rate, a bunch of us are going to have to buy and consume one thousand eight hundred and seventy-five breakfasts to cover the price of the new kitchen gear alone, never mind wages, rent or a modest profit. The fan will go in the window to the left of the power pole. One might inquire as to why the Fire Department is requiring a new hood system in the first place. It seems like half the mini marts in town are conducting food preparation with no ventilation system at all and I don’t think they have burned anything down. Mini marts are not using a large capacity fryer or stove that creates steam/oil vapors. They are self contained but all do have fire suppression systems in the small fryers. Having been contractor in the area (Boydston Construction) for nearly 40 yrs.. I’ve seen the pile of regulations, permits and various other requirements pile on so much that I cringe every time I apply for a permit of any kind. I’m sorry, Hasso….but you’ve taken on the Donald Trump school of Expose’ writing. Step 1 – find someone with a sad story. The story is made more sad if the original cause for the sadness can be laid at the foot of government regulation. In this case, Albany’s evil government forced the struggling small business owner into purchasing and installing an exhaust fan…a common tool in the restaurant trade. Step 2. – juxtapose a small-dollar purchase at the restaurant ($6 sandwich) against the cost of the exhaust fan to make it seem as though exhaust fan expenses are likely to drive the Restauranteur out of business. There are not enough $6 sandwich sales in the known universe to pay for an exhaust fan. Step 3 – ignore the reality that nearly every restaurant in the world has an exhaust fan. And that these restaurants have exhaust fans for a good reasons. No mention is ever made as to why exhaust fans are necessary. They are strictly a burden on business. Step 4 – make it seem as though requiring an exhaust fan is some onerous burden on the private sector, unfair and anti-competitive. Step 5 – at the end of the column, wrap it all up with generic, inconclusive aphorisms which do nothing to illuminate the subject, but serve only to jack-up anger amongst the readership. Step 6 – blame a government or quasi-government agency for forcing a restaurant owner to comply with health and historical building statutes that were in place LONG before the Restauranteur decided to locate to a particular site. Sorry, Hasso…but your formulaic attack simply fails in this instance. When firefighters have to enter a burning commercial kitchen and the grease is lit-up at flesh-melting temperatures, the firefighter work every bit as hard as that performed by the Line Cook does. The difference? If the Diner has a hood/vent over the cook area, there is a much better likelihood that 1) a fire won’t start, 2) people are far less likely to be injured or killed. Some may think a compromise over safety is wise. Foolish is more likely. This is just between you and me, and I’m hoping nobody from the City of Albany reads this post, but some cities require bloggers to fill out the required paperwork and purchase a business privilege license if the blogger sells ad space. For example, in Philly it’s $300, regardless of how much ad income you receive. But I’m certain the City of Albany wouldn’t resort to such nonsense with you, right? Thanks hh for bringing this to everyone’s attention. I hope a compromise can be reached that will help this business as well as meeting safety needs. In a free society the fire insurance experts would inspect such premises and determine the requirements to protect their companies’ exposures. Mr. Hartman knows he is blowing smoke at you Hasso. Instead of focusing on the issue he attacks you. I assume the required fan has drawing power of so-many cfpm. Does the place have a fresh air intake adequate so the fan is not pulling negative pressure? Could a combination of smaller less-expensive fans be used?? The owner should ask officials how they determined the size of the fan requirement. Cordier fires off a great double entendre. That said, it seems fairly apparent that Cordier has developed far greater expertise than I vis a vis exhaust fans. I would definitely rely on his input as I was moving forward with my restaurant kitchen installation. It’s a stinking exhaust fan, not a a moral calamity of excess regulation. Want a hood system fabricated to necessary size and CFM capacity? Never been a cheap fix. The question this raises is why didn’t the hood and venting issue get resolved when this business opened? The owner worked with all relevant officials in good faith, the permits were signed and they opened. It IS possible that the menu has intensified a bit over time, but any building official who has worked in the field would know that is a normal progression. You ask the permittee what they want to do now AND what the next iteration might look like. Also Red Daisy was there. Hasso, here is what the hood is all about. Dinner! Other good news, the City of Albany Historical Landmarks Advisory Commission approved the proposed alterations to the exterior of the building so that we can install the Type 1 Hood with Fire Suppression. This means we are OK with moving forward on installing the ventilation system that will allow us to have dinner service. Hopefully all will go well and we can finish this project in time for Christmas. Finally! We’ll be able to serve rouladen and sauerbraten for dinner! The equipment cost is astounding! I also would have been astounded if I had not been included in the restaurant rumor mill by virtue of my job. Hoods and ventilation are make or break for your business plan and in fact whether you rent a particular place. So many buildings you might think are a good place for a cafe are in fact out of the question.